In a blog about romance writing, The Healthy Writer Blog, an exercise for writers involved coming up with the names of your ten favorite movies. Many doubted they could name ten, although naming ten books would have been easy. Of course I was tempted to try to name ten myself, and why they are favorites. 1. Casablanca–duty and patriotism above love, but love renewed and acknowledged, and friendship found, too, with adventure ahead. 2. 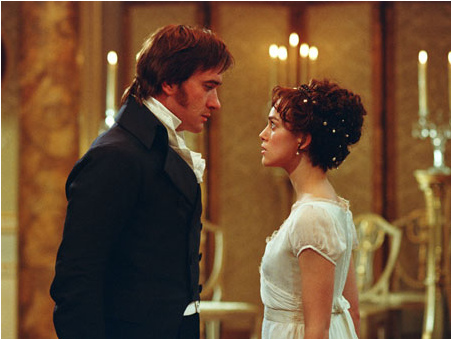 Pride and Prejudice–at all levels of society, our families and friends embarrass and betray us. People are more than what they seem on first acquaintance, and less. 3. The Godfather–it feels like a real family: the flashy son, the dogged one, the lame uncle, the messed-up sister, the failed attempts to compartmentalize. Plus opera, murder, and an outsiders’ view of the American establishment. 4. Emma–You are not as smart as you think you are, so stop interfering in other peoples’ lives. 5. Should it be the original Star Wars, because for once the girl got lots of good lines and carried (and used) a gun? And because it had the first-ever movie use of warp speed? 6. Adventure movies in which things “blow up real good” (quoting John Candy in SCTV), but none in particular except possibly Die Hard. 7. Most movie musicals, especially Grease and Kiss Me Kate–sometimes despite the hero-heroine power dynamics, sometimes because of them, but always because of the music and dance. And here I stop, because of the many movies I have seen, few are addictive to the point where if I accidentally bump into them on television, I will watch them. To me, that’s the ultimate test of whether a movie has made an impact on me. As you can see, I have allowed myself to list entire genres of movies as favorites. I suppose that’s cheating. No matter. It’s my list.